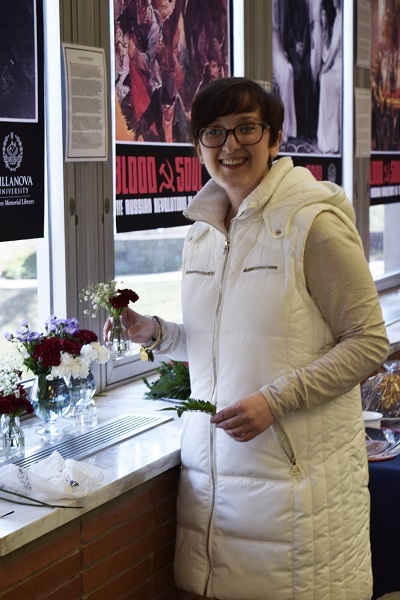 On Feb. 8, over 150 people attended the memorial service for the victims of the Russian Revolutions of 1917 in Corr Chapel and then came to Falvey Memorial Library for the opening of the exhibit, “Blood and Soul: The Russian Revolutions of 1917.” His Beatitude Tikhon, Archbishop of Washington, Metropolitan of All America and Canada, celebrated the memorial service in the presence of the rare Feodorovskaya Icon of the Mother of God which was then brought to Falvey for that evening only. 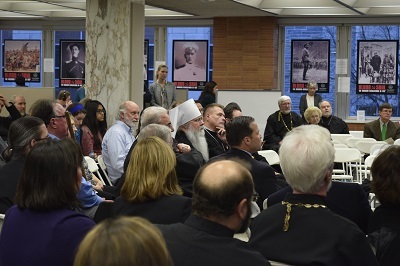 His Beatitude, Metropolitan Tikhon gave the opening blessing for the exhibit, “Blood and Soul: The Russian Revolutions of 1917.” Speakers were Michael Foight, coordinator of Falvey’s Special Collections and Digital Library; Michael T. Westrate, PhD, Director of the Center for Undergraduate Research and Fellowships and committee member of the Russian Area Studies Concentration; Adele Lindenmeyr, PhD, Dean of the College of Liberal Arts and Sciences and co-founder of the Russian Area Studies Concentration Program. Dean Lindenmeyr welcomed guests and gave a brief presentation about Russian history. 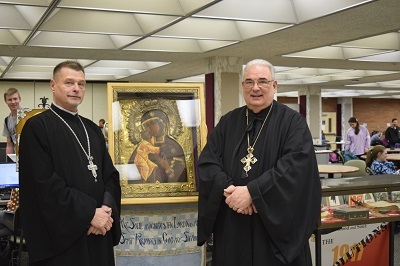 Guests visiting the exhibition had the opportunity to view the Feodorovskaya Icon of the Mother of God which had resided with the imperial family and to which it is said they prayed before being taken into custody and the Romanov Gospel which also belonged to the imperial family. These rare treasures were only on exhibit for that evening. 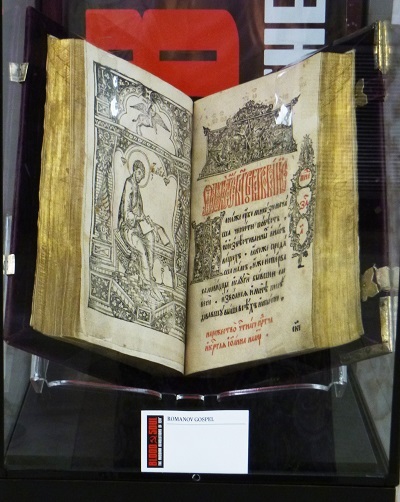 The exhibit was curated by the Very Rev. 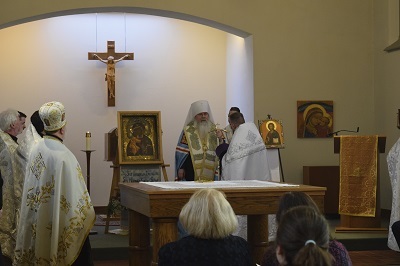 John J. Perich, curator of the Metropolitan Museum of the Orthodox Church in America and St. Tikhon’s Monastery and Seminary Icon Repository, South Canaan, Pa., and the Rev. Richard G. Cannuli, OSA, director of the University Art Gallery and curator of the University’s art collections. 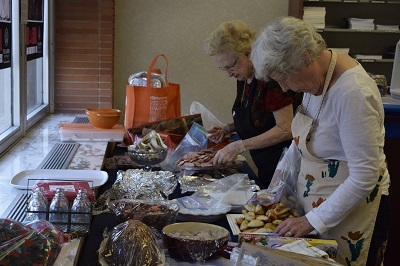 A bountiful buffet of homemade Russian foods such as a whole salmon, pate, salad, spreads and deserts was set up in the Speaker’s Corner and in the Holy Grounds Café. The exhibit will remain on view through Sept. 1. 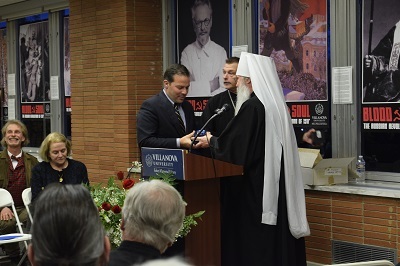 As part of the centennial commemoration of the Russian revolutions and the Enthronement of St. Patriarch Tikhon of Moscow there will be occasional lectures and programs while “Blood and Soul” is open.